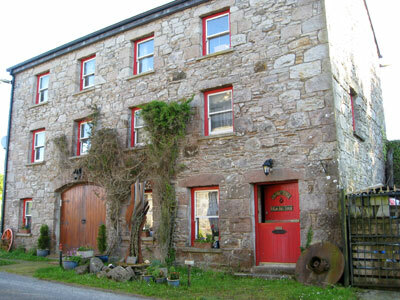 The Glore Mill Art Centre features art to view, commission and purchase. Small copper butterfly sculptures are forever reminders of the beautiful butterfly gardens grouped around a quadruple labyrinth. Art classes, labyrinth talks, walks and seminars are offered. A deeper connection with West of Ireland and the land of Mayo is offered by its wild beauty and history. Walking the labyrinths promotes inner peace. Reconciliation is fostered and a soul connection is experienced with the land and your inner being. The Glore Mill is surrounded on all sides by ring forts from the Iron Age. It is an ancient place of meeting, living and celebrating. By putting sole before sole in a labyrinthine circle a dialog with your own soul in a unique setting is begun. Classroom at Glore Mill arts centre.In the winter months there are evergreen gardens and in the summer months a bog wild garden and pond. A small traditional cottage garden is tucked behind the old stone Mill walls. Fishing is available along river walks and waterfalls to the Glore River Park. Mill equipment can be viewed as features around the grounds. Visitors will need weather proof footwear for the bog garden. 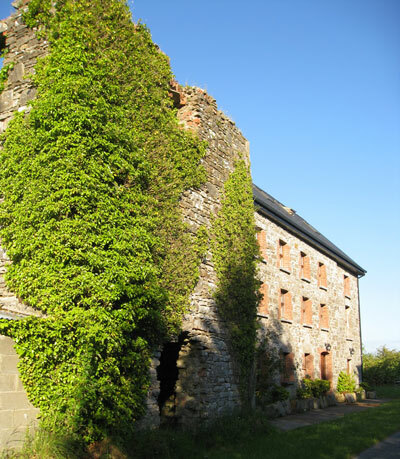 The Mill is close to hotels, spas, restaurants and B and B accommodation. St Patrick's Day and the Antony Raftery Spring Beltaine Festival are highlights of the year.